It disturbs me very much to receive so many nice gifts and not being able to return the compliment. It makes me feel and appear very cheap, which I can assure you is not in my character. Very many thanks for your kind thought & gesture of subscribing to the "Natural History Magazine" which I have just recd. the first copy. Frankly Earl I feel a bit embarrassed in accepting your generous gifts & not being able to reciprocate, it makes it difficult for ne to to fully express ny deep appreciation & also at the sane time tell you I would feel much happier if you did'nt do this - really Earl, sincerely, I get a great deal of pleasure & enjoyment in corresponding with you, but it disturbs me very much to receive so many nice gifts & not being able to return the compliment, it makes me feel & appear very cheap, which I can assure you is not in my character. Anyway, I trust you will fully understand, I value your friendship more than any presents. Sorry to tell you Mr Hardy is still about the same, does'nt seem to be making any improvement, poor fellow, its sure a sad situation not being able to move or talk (going on 5 months now) & confidently, he's slightly mentally affected at times - pitiful is'nt it?. We've been having a lot of rain lately & quite cold & believe it or not, SNOW (first in about 9 years) big excitement for the kids who have never seen it before. Guess you beard about the terrible plane collision here yesterday, killing & seriously injuring many school kids plus the plane crews, saw it on Tv on the spot news, removing bodies etc. no reason for them to be testing over populated areas when there's so much open space, both ocean & Desert. It was a shocking sight. Well, all for now Earl, trust alls well & happy with you, remember me kindly to Mrs E & love to your Leading Lady Cynthia. Natural History is a magazine on science and nature aimed at the general public published by the American Museum of Natural History in New York. Sorry to say Mr Hardy doesn’t seem to be making any improvement. He’s sure having a rough time of it poor fellow—it’s 5 months now—very distressing. Thank you so much for the nice Valentine card & letter. So sorry to hear of your accident, it must have been terribly painful, it hurts just to think or it, you were certainly fortunate your hand was'nt fractured, especially being your right one. Next time when you go out, do'nt ride in the car - sit on the bumper!! Its much safer. Anyway, hope by now you are rid of the pain & the colors match your living room carpet & drapes, you know you've got to Live Modern these days. Sorry to say Mr Hardy does'nt seem to be making any improvement, he's sure having a rough time of it poor fellow, its 5 months now - very distressing. Mrs Laurel wishes me to thank you for your kind words of sympathy in her bereavement. Mrs L. joins in kind regards & best to Mr H. & self & thanks again for your thoughtfulness. Many thanks for your kind letter 14th.inst. with enclosure of photos & news clipping. What a magnificent projection room you have - perfect in every detail, you've really got something to be proud of & make some of the Hollywood Studio rooms look like comfort stations! Its just fabulous, I certainly congratulate you on your wonderful achievement. I appreciated very much your taking time out to visit me Buck, it was indeed a pleasure to meet & chat with you, only sorry I was unable to entertain you as I would have liked, however I fully enjoyed every minute & incidentally, thanks again for your trouble in running that film for me (the new L&H). Mrs laurel joins in kindest regards - hope we shall have the opportunity to see you again on your next visit to Hollywood. Bye Buck, all the best. P.S. Deeply appreciated your kind thought re L&H, thanks a lot Buck, it is most gracious of you. Thank you for your kind wishes for Mr Hardy. Thank you for your nice letter of the 15th.inst. Yes I remember having the pleasure of meeting your Mother one evening at the Fox & Hounds restaurant here in Santa Monica - it is nice to hear from you. Thank you for your kind wishes for Mr Hardy, sorry to say he is'nt feeling too good, however, I know he will appreciate your enquiry. Regarding the book you mention, it has'nt been completed yet, & I really do'nt know when it will be published. Anyway, you can rest assured, as soon as it is, I shall be more than happy to autograph a copy of it for you. Mrs Laurel joins in regards & best wishes to your Mother, Dad & self & trust alls well with you all. My mother had met Stan Laurel at the Fox and Hounds Restaurant and told her how much I mimicked him as a kid. 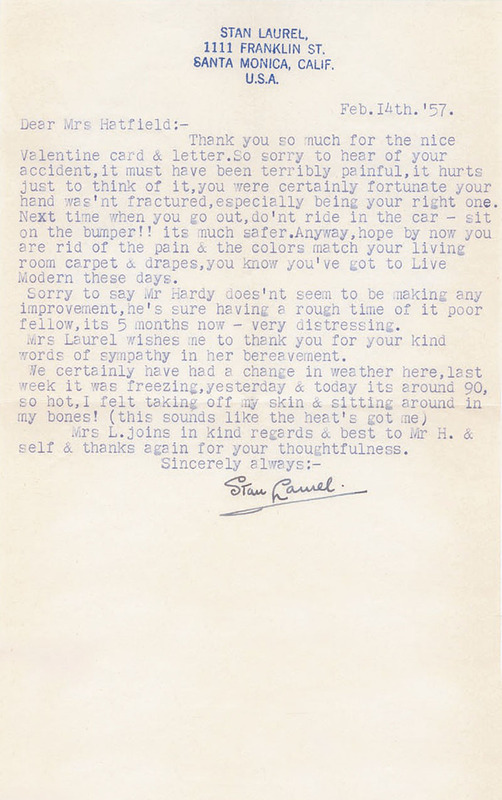 I wrote him a letter and he responded in kind—me asking about Hardy, who was ill at the time. I know Eric Von Stroheim very well. I met him last in Paris in 1950. Thanks your kind letter 5th.inst. Mrs L. wishes to thank you for your nice message of sympathy - much appreciated. Regarding artistes dropping films for night clubs, in most cases, I think its due to circumstances, there are many times a slump in picture production, so during these periods, the actors try to keep busy in other mediums, Clubs, TV or theatre shows, instead of being idle & waiting around. Some of course who have a name & have the necessary talent for night clubs, can command a great deal of money, especially in Las Vegas where they can & do pay 20 to 50 Thousand Dollars a week - those are Star names & have box office attraction of course, so it is'nt a matter of testing their popularity. Basil Rathbone is originally a Stage actor & many like him prefer to do a show on Broadway or on the Road, its a change of atmosphere & they like to feel the immediate reaction of an audience. On the other hand there are many who can't get work anymore in the films & have to resort to anything they can get, even to doing commercials etc. on TV. Yes, I know Eric Von Stroheim very well, I met him last in Paris in '50. he invited ne to visit him at his home, he lives in a small village, about 30 or 40 miles from Paris but I was unable to go as I was busy making a picture. I intended to go after, then took ill & went into the hospital.! I understand he has a small but beautiful estate in the country & quite a unique place, all kinds of antiques, suits of armour - old cavalary swords - muskets etc. & has a historic German horse saddle which he uses as a chair for his desk. He probably wears spurs while corresponding.! I'm very sorry to hear about his paralysis, thats terrible, poor chap - such a nice guy & a great artiste in his day. It is ironic that he is now suffering the affliction that he once played in a picture, I imagine he well remembers that performance. I do'nt think Karloff or any of them that play those type of characters have any great difficulty in portraying them, a good actor should be able to play anything that is written providing he looks like that person, regardless of his own personal & normal attitude. Thanks Earl for your kind thoughts & sending a card to Mr Hardy, but am afraid it would be of no avail. I understand he is now mentally affected - just totally helpless. I am most terribly upset about it, seems nothing can be done for him. Well, all for now Earl, my kindest regards to Mrs S. & self & love to Cynthia. Trust all is well & happy. Sir Basil Rathbone (1892–1967) was a South Africa-born British actor. He rose to prominence in England as a Shakespearean stage actor, and went on to appear in over 70 films. His most famous role was that of Sherlock Holmes in 14 Hollywood films made between 1939 and 1946. His later career included Broadway where he was awarded a Best Actor Tony in 1948. Erich von Stroheim (1885–1957) was an Austrian-born star of the silent film age, lauded for his directorial work. Boris Karloff (1887–1969) was an English actor best remembered for his roles in horror films and his portrayal of Frankenstein’s monster in the 1931 film Frankenstein. Have'nt heard from you for quite a while, wondering how you are getting along - hope you are feeling much better & everything going along good. Trust you got your accident case cleared up & have started your real estate business. Things here are about the same as usual, Eda is getting reconciled regarding her Brother's death, she was really broken up about it. Poor Babe is still confined to bed & does'nt seem to be making any improvement, am afraid theres nothing much more the Drs can do for him, its pitiful, poor guy. Well, all for now Betty, hope to hear from you soon with lots of good news. Eda joins in all the best to Wayne&self. Glad to know you recd. the snapshots. You're probably right about your Uncle Moralee not being too good in health, seems to be the only reason he hasn't written you for so long, I sincerely hope it's not serious - I too haven't heard from him for quite a while. Pleased to tell you, my friend got back & I was able to borrow his recorder,&made a copy of the tape I promised you, so am sending you the original that was made in Sunderland. On the reverse side of this tape is some kind of choir singing, it was on there when I got it & don't know what it is, probably the chap that recorded our act made it on some already used tape - anyway pay no attention to it. The reason I sent this original is because I copied it onto a reel I have of other variety acts, including Noel Coward, etc. so I can run everything without having to change reels so often. I have an interesting little collection of Star acts, old timers like Geo. Formby Jr., the late Sid Field, Sophie Tucker, Harry Lauder, Al Jolson, Jimmy Durante & a few American stars you wouldn't know of, also some very old ones which I copied from phonograph records of Marie Lloyd, Billy Williams, Alec Hurley & a very early record of Dan Leno. These are on both sides of one reel which I titled "Down Memory Lane," so I have about a two hour variety show on tape of top entertainment & Music Hall history. I run it once in a while for friends & they get a big kick out of it. I think I should call it "The Poor Man's Palladium"! Regarding my writing to your Brother, it would be a pleasure Ernie, but frankly, not having met him I would hardly know what to say, it would be rather difficult to start writing to someone I don't know - if he would drop me a line introducing himself, it would break the ice & would make the situation much easier, or maybe you intended to give him a surprise - if that's the case, let me know & I'll try & figure out a way to handle it. I added a few lines to you at the end of the recording as you requested, so it's very short as I'm not very good at speaking into a microphone, I get a bit conscious of myself & get lost for words, I just get tongue tied & freeze up for some reason - I guess that's why I resorted mostly to pantomime. Anyway, I did my best under the circumstances. I expect to mail the package tomorrow, so you should be getting it in about 3 weeks. Hope you'll all get some fun out of it.